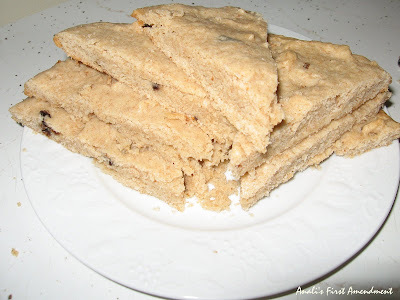 This shortbread recipe was inspired by none other than our own beautiful First Lady Michelle Obama. As a quick aside, if you haven't looked at the fashion and style blog Mrs. O, I highly recommend it. Back to how I developed this recipe. Marian Burros who writes blog posts for The Caucus, wrote a post about the high cost of hotels during the Inauguration. In the article, she included a wonderful recipe. I halved the recipe. Replaced the egg with Greek yogurt, made a few other changes and voilà! My new shortbread recipe was born. 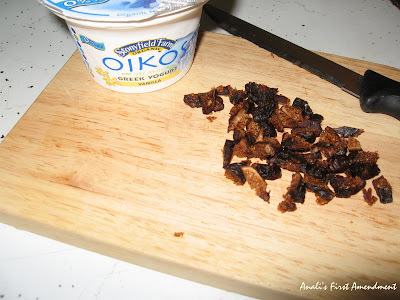 In case there is any confusion, I do want to make it clear that I received the OIKOS Organic Greek Yogurt found in this recipe free from Stonyfield Farm, which I mentioned in my last related post. Something new that I noticed since this last post is that their website has a store locator. I found it difficult to find this yogurt, so this should make it easier for people to find stores that sell it. Combine ingredients in a medium bowl. Stir well. This is a very small amount of dough. 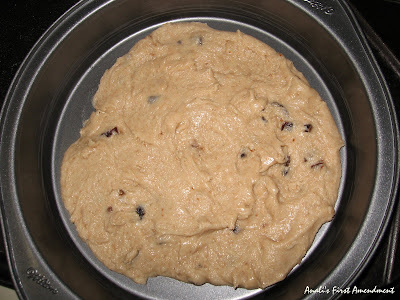 Place the dough in an ungreased round cake pan. Bake at 300 degrees for about 30 minutes. Let cool slightly, then cut into pieces while still warm. Enjoy! I don't like figs in anything but cookies so it looks like I'll have to invite some people over so I can make these and not eat them all myself!